I’d been to Washington D.C. precisely twice before the Women’s March; once as a high school student with my parents, and once in Fallout 3. The former was a blurred weekend of Smithsonian halls and lines to see the Declaration of Independence; the latter was much more immersive. I don’t have the hour count on hand but like so many other players, Bethesda taught me survive in another world using their uniquely American-style role-playing mechanics: Shoot and Loot. Fallout 3 wants us to think about America, about what it means to be American and where those values might drift should America cease to exist. Here’s the rub: the Capitol Wasteland functions not only as a nightmare but as an American dream. When the player emerges from the vault in the beginning of the game as the Lone Wanderer the game offers a promise. A player can take what they want and be who they want to be as long as they work for it. From the perspective of the player, the ideal of America never stopped existing after the bomb dropped. I’m not the first one to comment that for all the Fallout franchise wishes to imagine new and desolate future, it seems fixated on a terribly outdated past. Late-capitalism, sexism, and racism are living fossils the game animates with only a patina of satire. 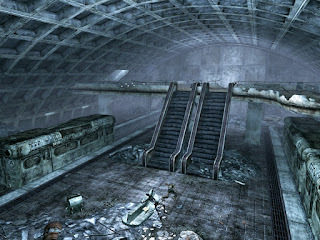 Still, somehow, beneath all the manufactured nostalgia, Fallout 3 gave me a sense of place and of belonging to my nation’s capital. All those high school weekends spent playing in my basement gave me what I can only describe as a digital foundation to resist. We left at 8 AM. At every intersection we passed, people emerged. People adamantly declaring the symbols of the march. People smiling at each other. People knowing together. I have never experienced such a phenomena. When we entered the metro, I looked up to those familiar coffered ceilings. The brutalist station layout overflowed with purples, pinks, and handmade signs. Though I’d never been to a protest before last weekend, I knew these subways intimately from my time exploring in D.C. Ultimately, we left the subway and walked into D.C. through Georgetown because the trains were so full. It was a gray morning with a certain gloom no unlike the swampy clouds that hover over the game space. The lived experience mapped neatly to the textures and bitmaps that had been tucked deep into my memory. It was as if I was loading up an old saved file. Before us, the obelisk rose – rendered not by processors but by masonry. In great ellipses we followed the path around its base as my memory twitched again. I had been here before, but only by myself. 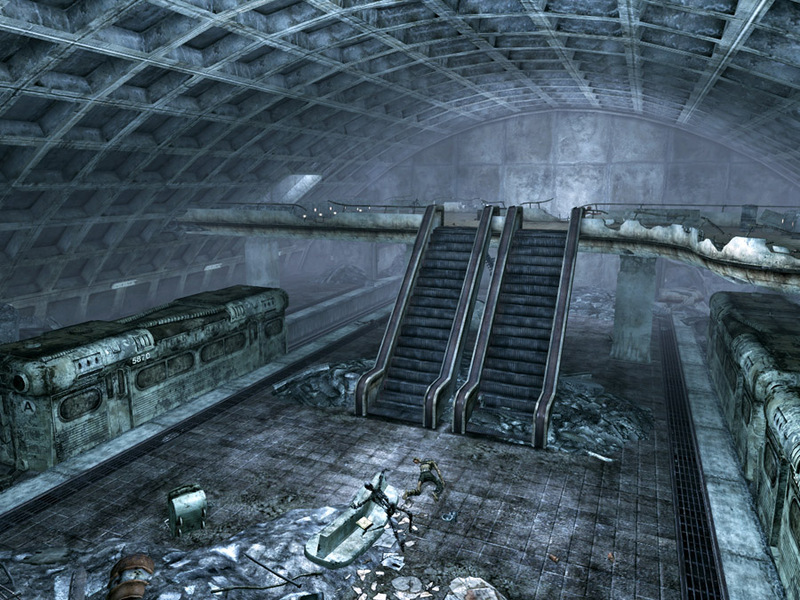 In Fallout 3 the National Mall is a war torn landscape echoing with gunfire. The player is always alone, surrounded by threats. But on January 21st 2017, only the skeleton of the inauguration remained as a new force surged across the dormant green. I was back. I was not alone and I did not need a gun, only cardboard signs, hats, and water. The surge of forward momentum was not unlike marching with Liberty Prime against the Enclave, except this time there was no need for an unstoppable robot. We were already unstoppable. When we talk about power fantasies, we speak dismissively of games, of their immaturity, of their false ideology and toxic masculinity. But power is important. People need power and to be reminded of their power. Fallout 3 was the salve to a wound I never expected to have when I unwrapped the game on the Christmas day before Obama’s inauguration. Now, though, I am thankful to have played that role. To have gone through the motions practicing a role I must now play for real as an American citizen. And everything eaten in the world dies. But no one fed on truth will find death. So they might not die. So if we are to make an examination of food in games during this month’s Blog of the Round Table then I feel a certain emphasis must be placed on games that layer together the complexities of consuming and how the metrics of meals can be tangled and re-tangled within a single ludic system. Call it calories or energy, hyper potions or Lon Lon Milk; game design has the potential to call upon the long tradition of using food as a symbol that weaves together concepts of existence, morality, fertility, and divinity in stories of grand feasts or humble last suppers. The trading card game, Magic: The Gathering, characterizes the potential nuances of games as multi-layered acts of feeding. Like the gnostic passage above, the resources with the game both synergize and antagonize each other until we realize that quite everything is edible. Magic is known for releasing new cards every few months in sets known as ‘blocks’ in which the designers at Wizards of the Coast put emphasis on particular aspects of the core, “vanilla,” gameplay. At its most basic, a game of Magic consists of a deck of hand-selected cards, known as a ‘library,’ as well as a discard pile for cast spells and dead creatures known as the ‘graveyard.’ Players play land cards that can then be used to pay the casting costs of spells and creatures. They deal damage back and forth until one can reduce the other’s life total from twenty to zero. The alternative win condition states that a player loses if they can no longer draw a card at the beginning of their deck (i.e. their deck has been completely discarded into their graveyard). These two long-standing win conditions create a simple binary between the player’s physical fitness (life total) and mental fitness (a full library). The immediate link between these two measurements of health is the overtly demonic mechanic of sacrificing life to draw additional cards or perform other actions that might ultimately pay-off by killing the opponent faster than you can destroy yourself. In fact, much of the morality built into Magic’s five-sided “color wheel” relates to the ways that each color of spell consumes or renews life total and card availability. Black spells traditionally exhibit a certain greed and aesthetic of the disposable while white and green value protection and longevity. Red and Blue provide a spectrum respectively between chaos and control of these same resources. An example of a pre-exile card that transports cards out of the graveyard. The irony of a zombie-cleric making the sacred profane might point to how we interpret these game spaces. Later in the 2010 rule update, Magic added an additional play area known as ‘the exile zone’ to solidify a space which several cards had already begun to experiment with the card text: ‘remove from the game.’ The concept of exile was to push for a space that was even harder to access than the graveyard. Whereas some spells could be cast out of the graveyard and other spells specialized in reviving your beloved creatures, the exile zone remains almost all-but-impenetrable. Between this trinity of zones, the five colors fight for unattainable supremacy in a never ending cycle. The two most recent blocks devilishly push and pull between the meanings and implications of these three spaces. Starting with the Eldrazi monsters of the Battle for Zendikar block, Magic developed a mechanic known as ‘Ingest’ that would allow Eldrazi to “eat” through a player’s library and exile the lost cards. In addition, other Eldrazi have the ability to ‘Process’ exiled cards and return them back to the graveyard as payment for special creature abilities. There’s a certain scientific (perhaps hydroelectric) feel to an ex nihilo mechanic which diverts a card’s potential energy through the exile zone before returning it to play and harnessing it against an opponent. Playing an Eldrazi deck forces a opponent to pay attention not just to what’s on the board and what’s in their hand but also how much of their deck has been removed from game. Thus while earlier cards such as Withered Wretch wished to simplify the game by exiling a card, the Eldrazi feed the exile space in order to confuse what is meta- or “beyond” the game and what is still very much a part of the game-as-metagame. In response to the corporeal experience of fighting Eldrazi, the following block: Shadows Over Innistrad, completely reverses the nihilism and builds on the Gothic theme that nothing ever dies. Spirits, vampires, and nightmarish horrors linger in this set and often return to play or revive themselves. The two-faced card “Startled Awake” and “Persistent Nightmare,” visible below, plays with the notion of mental trauma as the card’s abilities allow it to physically cycle from hand to graveyard to play and back again to feed on the other player’s deck. Despite the threat of reducing one’s library to zero present in cards such as “Startled Awake,” Shadows Over Innistrad pays equal attention to the player’s own graveyard. The mechanics known as ‘Madness’ and ‘Delirium’ twist the concept of a full library as mental stability while also transmuting the notion of a graveyard into a strange receptacle of both mental and physical corpses. Cards with ‘Madness’ state: “If you discard this card, discard it into exile, When you do, you may cast it for its madness cost or put it into your graveyard.” The parallels to ‘Ingest’ ought to be clear but this time, instead of an opponent abusing the library to feed their ravenous creatures, the player willingly sends their own cards into exile only to reconstitute them back into play. The mechanic’s name draws upon the 19th century conception of madness (see the works of Charlotte Perkins Gilman or Nikolai Gogol) as a professed assertion of a different reality. The traditional heuristics of Magic suggest that discarding a card from your hand hurts your potential to play that card later on in the game. ‘Madness’ rewrites that assumption and allows you to engage in your own self-destruction and profit in return. A card such as “Alms of Vein” perfectly elides the theme of vampiric loss and renewal that repeats throughout the cards. While vampires are traditionally thought to be predatory, the card’s image suggest the first-person viewpoint of a character who charitably gives to the vampire repeatedly in order to receive some sort of reward. The image further confuses the relationship between player and opponent: is the player mad to allow a vampire to take their own blood in payment for blood magic, or does the spell suggest that the player is the vampire leeching the life away from the opponent? ‘Madness’ pressures the player to use every card, to actively remove your hand while simultaneously stretching the potential energy of that movement. After all this self-sacrifice settles the set's second key graveyard mechanic begins to take hold. Cards with ‘Delirium’ have a trigger that activates further abilities if the player has four or more card types in your graveyard. The mechanic puts pressure on getting not just sorceries and instants (spells that naturally resolve and go to your graveyard) but also creatures, lands, enchantments, and artifacts buried into the dirt. An initial interpretation of ‘Delirium’ suggests that the mechanic invokes some sort of hallucination or confusion within the mind. While other decks (think of someone playing against the Eldrazi’s ‘Ingest’) might consider spells sent to the graveyard as lost potential, a deck specializing in ‘Delirium’ prefers to actively diversify their portfolio of lost cards. The graveyard is no longer the antithesis of the library but a parallel library which grants spells further incantatory strength. All these reversals further madden the sense of victory since these mechanics make it all the more difficult to interpret whose consuming whom. Perhaps the mascot of Shadows Over Innistrad is not the heroic angels or chaotic demons that dominate the promotional material but the humble “Sanitarium Skeleton;" a creature able to return from your graveyard to your hand at anytime. The flavor text of the card reads: “His mind was lost long before his flesh.” Presumably the bony prisoner of this unknown asylum no longer has brain nor brawn and yet his ability prevents him from ever being completely gone. The world of Innistrad revolves around eating, regurgitating, and re-eating his undead corpse. I hesitate at the neologism on my screen; “re-eat,” sounds fundamentally wrong and yet perfectly (post?-)post-modern. Players are not just recycling this card because the term suggests that he is valuable as reclaimable resource. Wrapped up in the binds of a strait-jacket, the skeleton takes on the role of a trussed up chicken meant to be served again and again as a discard placeholder for other cards demanding sacrifice. The skeleton might never even be played, it only promises the potential of play. Meat and nitrates meant to be-looked-at before instantly spoiling. These rapid-fire observations of contemporary Magic sets represent resistance to the notion that the game design revolves around 1:1 ratios of health potions to health bars and mana potions to mana bars. Food is not just for healing. It can be equally destructive, consuming, and exhausting. It might never even be eaten! The role of food elicits questions such as who produces the food, who receives the food, and who fails to eat? The need for food, for resources remains fundamentally tied to our own mortality in much the same way that absence of any food signals and promises death. As we wait to see what new graveyard and feeding mechanics emerge in Shadow Over Innistrad’s sister set, Eldritch Moon, it is not too early to say that the designers of Magic have joined the leagues of mystics and anthropologists who force us to question just what are we eating to survive? This piece was inspired by Critical Distance's monthly prompt, "Blogs of the Round Table." [BoRT: March] Have You Ever Looked at Master Chief's Feet? Agile and limber, dancing on three-inch wall protrusions, I am so much more than a thousand-pound space marine. I hop along the rooftops, tagging jackal snipers that strut from the oblivion of half-hidden spawn points, while enemy fireteams stand inactive in the shadowed alleys of Old Mombasa. When my brother and I received Halo 2 on Christmas Day, 2004, it was both our first Xbox game and first first-person-shooter. Without the distraction of Xbox Live we replayed the campaign levels with the repetitive scrutiny of archaeologists scratching in the same dig site day after day. Halo 2’s story is noticeably the most fragmented of the series. The came jumps back and forth between the franchise protagonist, Master Chief, and a dishonored general turned special operative, The Arbiter until the two meet and unite against the threat of galactic annihilation. “Space Opera” does not even begin the capture the grandness (read: blandness) of the game's twists and turns and sudden transitions from planet to planet to space station; jungle lake to snowy tundra. In many ways, I over-consumed the narrative. What should have been a brief experience dwarfed by weekends lost to the addiction of competitive multiplayer became an optimized ritual unto itself. My brother and I learned where extra vehicles were hidden, which alcoves held additional sniper and rocket ammunition, and which side routes provided a tactical advantage. These experiences lead me to reject the traditional claim that Master Chief's blank face-plate allows the audience to project themselves into the ultimate super solider. As we explored the architecture of each level we became more quartermaster than commando and more concerned with the minutia of supplies than the titillation of combat. A comparison to Doug Liman's military scifi thriller, Edge of Tomorrow (2014), might perhaps help us understand the irony of player choreography within the framework of the “action genre.” Whereas the pleasure of most action movies is the way the characters spontaneously respond to challenge after challenge with fists, swords, or guns, Edge of Tomorrow makes the audience aware of repetition and staging within action films. Tom Cruise's character can only transform from journalist to soldier through countless respawns that teach him where each danger lies waiting on the battlefield. Much of the film's visual pleasure emerges from the learned perfection of a well-timed dodge or double-kill. The film bridges the gap between games and cinema and asks us to consider how we play and how we replay. My experience with Halo 2 stretches beyond Edge of Tomorrow's deconstruction of the action movie and leads me to ask: How does repetition both slow down or enhance a game experience? In a level called “Regret,” situated roughly in the middle of the campaign, there is a moment when a gondola arrives to carry the Master Chief over a lake. After killing numerous enemies who intended to storm out of the gondola and attack the Chief, I would wait for a Pelican (the game's dropship) to fly by and release several resupply canisters filled with power weapons. Because the game limits you to carrying only two weapons at any time, the superficial implication is that the player should pick their favorite means of destruction, then get on the gondola and forge ahead. Instead, I made a habit of ferrying each weapon onto the gondola, trading it with an alien weapon dropped among the corpses I just killed, then going back to the resupply canisters to exchange the inferior plasma firearm for another power weapon. The game takes a tranquil pause until I've littered the gondola deck with shotguns and rocket launchers and launch onward across the lake. I think this sequence represents a tension in the game's design because my little maneuver worked to both arrest the level's forward momentum while simultaneously empowering me with more tools of destruction to fight more aliens on the other end of the gondola ride. I had to discover that this little piece of choreography will help me later on in the level. It represents on of so many little dances that both optimized my play and distanced me from intended machismo. If first person shooters are meant to embody military perspectives and fantasies of warfare, who am I when I stop shooting? There is something profoundly un-Master Chief about snooping around for extra sniper ammo, yet, in order to play on Legendary mode, the game's highest difficulty, the aforementioned “Legend” needs to start doing less running and gunning and more walking and collecting in order to survive. A few weeks before the Xbox appeared under our Christmas tree I remember when my brother's friend brought over his own Xbox and a copy of Halo 2 during a sleep over. During this brief preview I recall that as the friend showcased the game's graphics and gore he would occasionally look down with the joysticks and look at the Master Chief's feet. Not every FPS shows the player's feet he insisted; for emphasis, he occasionally stuck his own shins with a plasma grenade and ran around before blowing up and respawning. The feet mattered and the paths they take matter, treading and retreading the battlefield. Four purple blurs, four lives, four Xbox 360s linked over a fiery hellscape. This is the final level of the Halo Trilogy, this is the Vidmaster Challenge: “Annual” —one of the most unforgiving experiences in gaming history. I completed it six or seven years ago though I can’t say I’ve saved the memory with any particular accuracy. I recall slogging our way to the foot of a snowy pyramid, only to slog our way to the top of that same pyramid, only to drive across grueling kilometers of cinematic explosions. On its own, the final level, simply titled “Halo,” sought to conclude the series with a cyclical return to the circular superstructure. The developers at Bungie released “The Vidmaster Challenges” almost a year after Halo 3 as a way to revive the campaign experience with additional challenges and connect the series to Halo: ODST’s prequel campaign. Ultimately, after earning all seven Vidmaster achievements split between both Halo 3 and Halo: ODST, the player could gain access to the Recon Armor in Halo 3’s online multiplayer. The Vidmaster Challenges were notoriously cruel since several of them required playing through a campaign level with three other players and with the Iron Skull turned on. Whenever a single player died, the Iron Skull automatically returned all players to the last checkpoint. Suddenly, what should have been a sci-fi romp turned into a stop-and-go nightmare requiring more restarts than a cheap wireless modem. The Vidmaster Challenge deserves attention as a case study because the mechanics did not get more difficult yet the game became more “unforgiving,” due to the Iron Skull. According to this model, save systems represent how a game forgives players for their mistakes and determine the stakes of investing time and energy into a game. For example: arcade games and perma-death rogue-likes deny the player any respite from failure; the slightest misstep, miscalculation,or poorly-timed jump sends the player back to the title screen. A Bethesda or Bioware RPG takes an opposite approach to the problem of preservation. These games provide almost endless access to save files so players can safeguard themselves against a slew of possible accidents and bad dice rolls. Under the aegis of a comprehensive save system, players can feel confident that minor errors will not disrupt their long-term participation with the narrative. The ability to save progress does not make these games any less difficult— many challenging games offer robust save systems— it just means that these games emphasize long-term reward by diminishing the damage from individual mistakes. In other words, the forgiveness built in a save system is directly proportional to the amount of personal investment designers intend the player to have with a single play session of the game. Halo 3’s save system fell in the middle of the two extreme modes. On one hand, the “30 seconds of fun” dictated in Bungie’s design mantra depended on the ephemeral adrenaline of arcade shooters. Failure to understand the rules of these short-lived bullet mayhems punished the player with death. On the other hand, the designers also wished to present a narrative that (however cliché) justified the cost of the game and brought meaning to the random alien encounters. Death provided tension for each individual firefight but to in order to prevent narrative arrest (and too many Spartan corpses) the game could never be allowed to lose its narrative momentum. As a compromise, the checkpoints automatically saved and restored the player to the beginning of each skirmish: far enough back to punish the mistake while still promising a chance for rapid amends and progress. Co-operative play in the Halo series promised even more space for tactical creativity. As long as at least one player remained alive, all the other players could respawn around the lone survivor and return to the carnage. I believe the Halo series was always meant for co-operative play. Players maximized both the arcade excitement and the level’s narrative unity by playing into the rhythm of teammate resurrection. The Iron Skull shattered that balance and stripped away the forgiveness of co-operative respawning. The additional rule destabilized the traditional co-operative struggle and (I would imagine) infuriated many players. In the wake of this merciless achievement, however, the Halo 3 “Annual” challenge managed to reassert the human value of co-operative play. The catharsis of the Vidmaster Challenge succeeded because it transferred the power of forgiveness from the computer back to the player. There was no way to survive the Vidmaster Challenges without accepting that you and your three compatriots will make mistakes. These errors would be numerous, idiotic, and demoralizing. At every step of the way, internal frustration threatened to destroy everyone’s progress if a single player succumbed to rage quitting. The challenge no longer became a measure of skill, it became a measure of forgiveness as players needed to learn to absolve the errors of others. Suddenly the experience sounds more like a Sunday sermon. Though there had always been a ubiquitous aura of Christianity shrouding the Halo series, the franchise was only ever a parable left stillborn. Suggestive names such as: The Flood, The Ark, and The Prophets promised audiences with a Judeo-Christian story of salvation but the writers never allowed the message to shine past the lamina of science fiction and Marathon references. Even the final level bore comparison to Dante’s lowest circle of icy hell where Guilty Spark betrays his human companions in a misguided love for the Halo itself. The games always wanted to draw from the wealth of the Bible but they stopped before calling into question the fundamental acts of violence that the New Testament so abhors. The Master Chief could never be resurrected if Spartans never die. The “Annual” challenge made a final attempt to explore the Christian potential of the Halo Trilogy. In place of four horseman of the Apocalypse, the Vidmaster Achievement turned the players into four disciples willing to forgive and endure. The obvious symbolism is that each player needed to complete the level by riding a ghost, perhaps the Holy Ghost, as sign of faith. In the final sequence of the game, the Halo begins to collapse under the players as they ride to the safety of a waiting ship. In that moment, the Halo represents the machine, the weapon, the non-human promising salvation but only delivering destruction. By successfully completing the challenge, the players liberated themselves from the limits of the machine. They no longer relied on the game’s forgiveness and they rediscovered the ability to forgive others. Those who bought Halo 3 were promised the opportunity to “Finish the Fight.” For the few who chose to complete the campaign’s Vidmaster challenge, the experience offers a chance to “Finish Fighting” and find peace. Critical Distance's Blogs of the Round Table inspired this piece. If you like video games writing, consider checking them out. Maps make no sense. Many people know this, yet we keep making them to organize our sense of space. Jorge Luis Borges’ flash fiction reminds us that the perfect map is useless and instead cartographers must find balance between abstraction and representation to produce maps that can guide us from location to location. A discussion about maps within digital games threatens to fall into the same analogy of a “real” landscape being turned into textual and symbolic representation. This comparison seems flawed since all digital architecture is first and foremost an abstract map-state before ever being realized as a two or three-dimensional terrain filled with visual landmarks. Unlike an explorer who wants sails to uncharted coasts then meticulously sketches what she sees a as video game designer first writes “Here be monsters,” and them the artists and programmers make the dragon appears. What we might call the “reverse construction” of digital maps means that all digital space has a narrative foundation to its architecture. From the lowliest iPhone app interface to the campaign of the next Call of Duty game, there is always a way the designers want us to navigate the spaces they create. The 2008 game, Gravity Bone, shows us how the subjective experience of narrative can complicate our traditional understanding of maps and literal space. As a short spy-adventure game that requires fewer than fifteen minutes, Blendo Studio’s experimental storytelling stands at the threshold of the post-WASD generation of indie titles. (It can be downloaded here and I recommend a quick playthrough if you want to avoid the spoilers below). Heralded by many as a novel and witty arts game, Gravity Bone plays on the tropes of adventure games only to cut short and kill the player in the second level. I still remember the surprising gunshot, theft, and broken window that diverted the game’s narrative into a blurred and frantic first-person chase sequence. The jump from the hotel window led me into a neon noir where layers of highways, tramways, and catwalks cling to a concrete canyon while below a glowing and polluted river threatens on the verge of coagulation. The woman jumped down a hole and I followed and flowed effortlessly through chute after chute until we landed upon a table surrounded with masquerading diners. The party goers watched as we unexpected guests dodge and double back through the room only to leave a cloud of shattered champagne flutes in their wake. The door led the woman back into the smoggy darkness where her feet pattered over the metal grating of a dangling catwalk. When I finally caught up to her around the corner she drew her weapon and fired until my body toppled over the railing. My first person view falls slowly like an elevator stopping at each floor to welcome forgotten memories. The flashbacks of past heists and danger inter cut on the screen as I gaze out on the cityscape. Finally, moments before my body lands on the highway, my visions settle on the image of a woman winning a footrace. 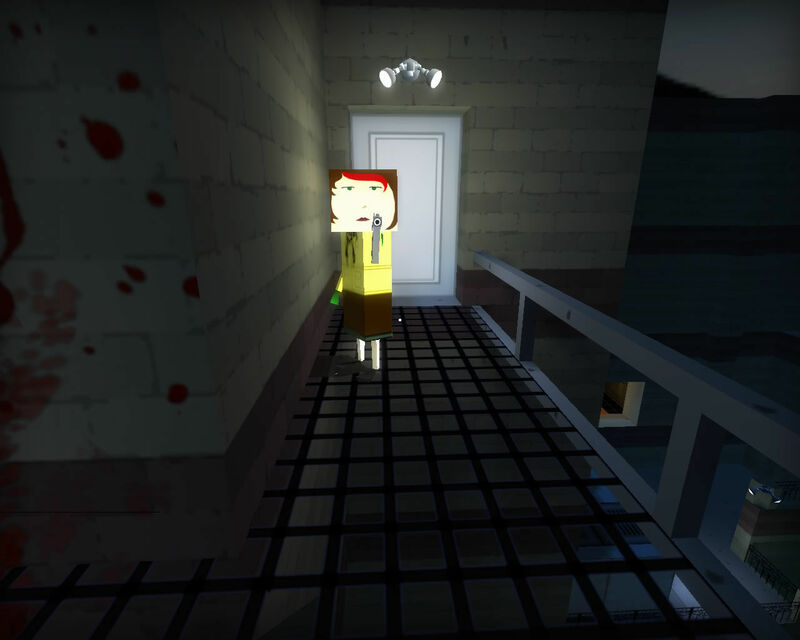 The falling death sequence mirrors the first image of the game where the player begins by descending in an elevator. This visual cues point us to an idea of “verticality” which has often been ignored by the game’s commentators. Much of the progress through the earlier portions of the game subsists on descending into the “furnace rooms” where the player find useful items and then emerges back into the hotel sequences to solve minor puzzles. These chthonic spaces promise at some seedy mechanical dystopia that lurks under the cocktail party elegance. Ultimately, the protagonist, Citizen Abel, fails to be a successful spy who can rise and fall between these two spaces and instead falls one last time to his death. What we have in this narrative is an acute awareness of the z-axis, a space that is often ignored for the more popular length and width, “x,y” coordinates, of cartographic space. 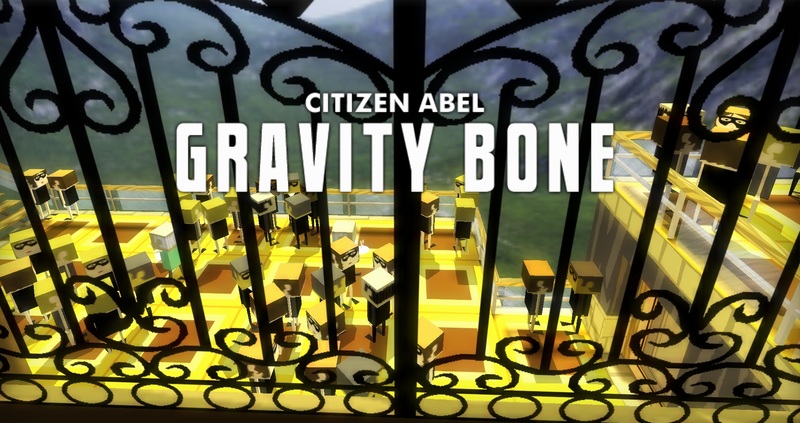 Not surprisingly, Gravity Bone is also the kind of action game where maps seem unnecessary. Unlike a sandbox game or RPG, adventure games assume linearity and are often celebrated for elegantly designing a world that guides the player the way a backlot studio tour might lead movie-goers from set piece to set piece of their favorite summer blockbusters. We don’t want a map because we never need to back track or find alternate routes to these locations. Once we experience a specific location we move on forever. In light of this illusion, I propose that action games deserve the most critical cartographic examination. Their mesmerizing, blockbuster pacing too often persuades us to forget the journey and instead revel in the chain of destinations. The notion of “gravity” in Gravity Bone promises this sense of natural acceleration towards the final contact with asphalt but, the moment I take a step back and analyze the passage through space, the illusion collapses. When I reached the final catwalk and the woman shot me my vertical elevation was actually above the hotel window where the chase began. You can see it in the picture below; it’s the little window in the bottom left. This is physically impossible since throughout the entire chase both characters only moved downward. The chutes streamlined the entire chase sequence and forced me to move only one direction. The M.C. Escher lithograph gracing the top of my post provides a visual depiction of Gravity Bone’s vertical chicanery. 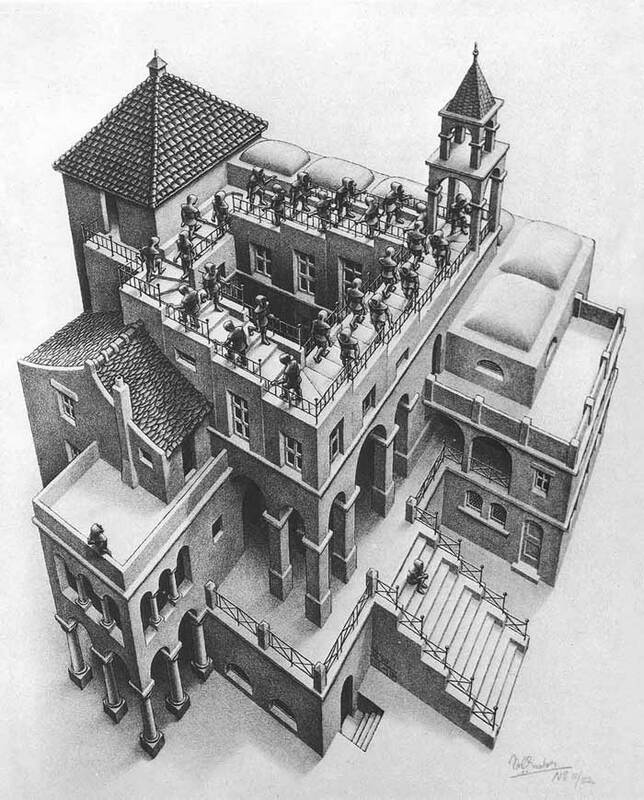 Known as the penrose stair illusion, this image depicts the physically impossible yet visually conceivable infinite staircase. Gravity Bone’s chase is a virtual realization of the penrose star. What’s curious about this realization is that it did not disorient my experience during my first playthrough. I only noticed the discrepancy in height after several replays-- the narrative actually masks the architectural impossibility of the situation. Gravity Bone’s narrative arc and ultimate catharsis demanded that the city rearrange itself to let the protagonist fall farther than what ought to be possible. The discrepancy between altitude offers an example of architectural metaphor unique to videogames. What other spatial inconsistencies have I walked right by in video games? What steps do designers take to hide space and distance from our digital eyes? More importantly, how can we add these fantastic virtual leaps to our growing arsenal of hyperlinks and Twine games to build a more powerful nexus for self-expression and storytelling? I suspect Borges and Escher still have much more to tell us about the rules and rule-breaking potentials of those atlases that arrange our world. Half-way through Dodongo’s Cavern I enter a room with a sunken floor. The camera pivots upward behind the Kokiri orphan to approximate the top-down screen of a two-dimensional Zelda game. Behind Link, through the window of my 3DS screen, I watch the future Hero of Time stand in his leather boots on the square blocks stamped with the cross insignia of some by-gone Goron architect. Below him are several square pillars promising to divide the space into a grid of muddied stone corridors. I climb down and listen to the boots making a soft patter against the ladder until they reach the dirt floor of the cavern. Immediately, a blade whirs across the screen and slices a quarter heart out of my body. Running in terror only adds to the confusion as the camera smashes into the back of Link’s head guided by claustrophobic algorithms. I guide my avatar to the safety of an even narrower hall as Navi desperately warns to me to spy around each corner with the L-(formerly Z-) targeting system. The sound of razors continues to ring into the room and warns me of further danger as I sidle the walls then sprint across hallways with the blades whizzing inches behind my blonde locks of hair. These were the Blade Traps. Once I reached the opposite side of the room I could rest, pull a block, then continued on my way deeper into the dungeon. I bested Dodongo later that night. Now, even as I begin my trek to Zora's domain, the the poor design and blinding camera angles built into that meaningless, one-trick trap room stick to the forefront of my memory. For the most part, the formulaic rooms of a Zelda dungeon always promise variations on a theme. Dodongo’s Cavern introduces bombs and then teaches the player about all the enemies and environments they can blow up. Occasionally, like some sort of cumulative exam, the game refers back to a previously learned skill such as lighting a row of torches as first introduced in the Great Deku Tree. Otherwise, the player never needs completely new knowledge to pass through a room, only some vague trust in recapitulation. The placement of these blades did not align with the aforementioned mantra of Nintendo’s dungeon design. They seem to be relics of previous games in the series and that return from the past made them all the more unsettling. The difference you will notice in this screenshot from the original Legend of Zelda is that the blade traps appear in an over-the-top grid layout, letting the player navigate the room with precision. In contrast, my experience with the blades proved that the over-the-shoulder hallway incident provides a disservice to the camera and turns the potentially artful challenge of timed accuracy into a chaotic run-and-gun. In my re-play through Ocarina of Time on the 3DS I’ve noticed this was not the first time the designers crafted a room with the blatant intention of referencing the two-dimensional space of previous games. Similarly, the Castle Garden’s stealth section and the maze at the entrance to the Sacred Grove both force the camera to pan up and recreate the two-dimensional viewpoint. These sections become bothersome as the multi-directionality of the joystick does not allow me to move in the cardinal directions demanded by a Cartesian graph. The effect is a reference to the franchise’s design history while the player stumbles without the necessary tools for navigation. I describe these awkward moments as a form of nostalgia, particularly design nostalgia, which encourage a company to plug-in a pre-existing mechanic or scene into a previously unknown situation. The Greek term quite literally means nostos or “homecoming,” and algos or “ache.” Hidden beneath Hyrule’s new polygon veneer, it is as if Nintendo wanted to assure players that this was the same space they knew from games set in the aerial perspective. The persistence of Hyrule landmarks such as Lake Hylia and Death Mountain further emphasize the notion of returning home to familiar spaces despite how drastically the actual presentation varies between games. For the designers, the comfort of this nostalgia must have simplified the design process despite the end result being significantly sub par to elements of the game that actually acknowledge the new potential of three-dimensions. These quotations might seem like superficial internet mockery of several triple-A titles from this past decade but, in my view, they also exemplify how our conception of the "New" is always limited by pre-existing paradigms in design. These slogans become a form of trust between players. I can recommend this game to you because it has all the qualities you already know; they’ve only been remixed. Note: I don’t intend to argue that marketing ruins originality since advertisement only emphasizes a certain universal human principle: we like what we already know. No one is immune to the bias of design nostalgia, but it does have a purpose. Analogy and comparison offer pause from the unending tsunami of novelty pouring down our newsfeed. Technology can be terrifying; the sheer power and potential of the computation machines we all carry in our pockets and backpacks threaten to overwhelm our minds, so we use design nostalgia to provide comfort in these foreign and digital spaces. No one complains that Microsoft Word insists that a floppy disk denotes the universal symbols for save. Our interfaces depend on phylogeny. The notion of “spiritual successors” promised by numerous Kickstarted games represents another instance of gaming nostalgia promising the comfort of game mechanics we’ve already mastered. Just as our bodies need a home, our fingers need a home row. Despite the logic of these decisions, they always threaten to weaken the potential of the gaming medium. As I observed with Ocarina of Time, reliance on past solutions to design challenges leaves certain moments of a game vapid at best and functionally incompetent at worst. Reliance on the categorical archetypes of Tower Defense or Walking Simulator predefines a comfort zone where all members of the trinity: creator, critic, and audience, languish in uncritical stupor. I am not the first to call attention to the rupture of design between two and three dimensions, but we should not limit the case study to one moment in video game history. Games are fundamentally iterative, and thus the audience demands that all proceeding copies hoping to exhibit new technology must graft their advances to the comforting mold of the progenitor. How might a game function to strike us in the head? Would our fingers float wary and unsure over the keyboard? Would we feel useless as unknown systems churn our tepid inputs into unintuitive results? These kinds of wounds are different from the slashing, stale blows of the Blade Traps awkwardly repurposed. I do not play Legend of Zelda or any other game for rooms such as the one in Dodongo’s Cavern where violence punishes my very decision to play games. I play games that strike at the core of my rational capacity to figure it out. When we already know what to do, when every first person shooter maps to the same controls, then we've eaten the Lotus and lost the right to call games art. To contrast this redundancy, I point to games such as Problem Attic and Starseed Pilgrim which might begin to represent spaces where nostalgia does not dominate our games. Of course they borrow from a lineage of design (the platformer in this case), but at their core they use design to remind me of my own insufficiency. I do not inherently know what to do when the game begins. In a world where technology companies dedicate their resources to comfort and usability it might be valuable to take the time and feel not-quite-at-home. Question all design nostalgia. Does it amplify a concept or simply recycle and make homey a challenge that once gave you thrill? Look for games that make blows not against the avatar but against the player. Like all mature media, games have the opportunity to resist their players; we don't have to understand what our role is in a system when we play. Undeniably the call to feel lost in a new era of game design feels daunting. My challenge fundamentally asks you to move away from the games you grew up with. Like the young boy setting off from the forest he called home, we too must have the courage to leave the home row.